I’m sitting in my new office, eating my yogurt and waiting for the floor guys. Django is lying on the rug, waiting for me to finish my yogurt. Seven scripts about Microsoft Office and one about a lovelorn college grad are arranged in ones and zeroes inside my computer, waiting to be finished. Somewhere across town, two chairs await transport to this room. Will they be perfect? Will they help to make the papershorn plaster walls look more villa-y and less ravaged-y, or will they just be completely wrong? I bathed a plant last night. 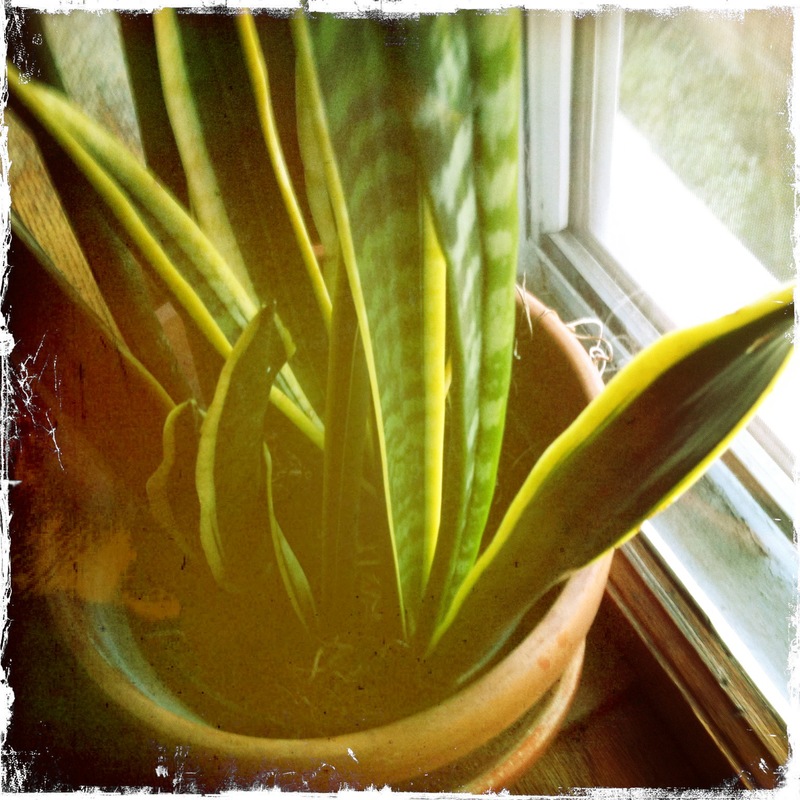 It’s a mother-in-law’s tongue. At least, that’s what the guy called it when I bought it a few years ago at Plants, Inc. I was with Syd, who was shopping for an easy indoor plant, because she tends to kill them. Incidentally, Syd just emailed, asking how my weekend in Madison went. Theoretically she’s waiting for a reply. Though it feels like most of the waiting with email happens to the recipient. You get one and then you wait for the right moment to respond. You wait for that big chunk of time to answer all your non-urgent emails, or that small chunk when you can answer one or two. You wait for time. Or, at some random moment, when you’re deep into another project that absolutely must get done today, perhaps it’s a new ending for the lovelorn grad or maybe it’s video 4, Working with XML Schemas, when suddenly and for no reason you switch gears and pound out a needlessly long reply to a friend. And pass the waiting along. So I bought it, and three years later it looks exactly the same. Except that after the first round of floor guys, it was dusty, so last night I put it under the shower. I rubbed wet sawdust off the leaves and looked for some kind of change, a dead leaf even. Nope, they were all intact. I snapped off one leaf anyway, just on principle, and it was a struggle to detach. Now it sits on my windowsill, waiting for nothing. I water it regularly and give it plenty of indirect sunlight, and it continues to look exactly as it did at Plants, Inc. Is it an inch taller?Maybe, maybe not. Django has cleaned the yogurt container. The floor guys still aren’t here. Their boss just called, mortified, to explain that they went to the wrong job. Someone who should be waiting is not. Every now and then I wonder why a gardening professional would leave a plant in a closet for six months. I must email Syd and ask whether her ivy plant is still alive. i was WAITING for you to reply!!! just kidding. i was peacefully snoozing on the back porch with my dog and a pile of things i probably will not read today because i am too busy snoozing. that plant did not thrive…but the one i bought shortly after its demise (my fault, i am sure, though i did not leave it in a closet or anything like that) is growing like crazy in the living room window. i actually have to trim it sometimes, so cat won’t be able to nibble on the cascading greenery and then vomit plant material on the rug. hope the floor guys arrive soon. So glad you posted today. I missed the robot. Just enough time between nutso trading to read this, and it was just the temporary diversion I needed. This edition of Robot leaves me on the fence between quiet reassurance and profound sadness. Is the houseplant a metaphor for the remarkable resilience of the spirit, or is it a reminder of how the human heart can close itself off to the world? Or is it both? By the way, now I have that Tom Petty song in my head….The waaaaiiiiting is the hardest part…. Robot back. Other Donna happy.